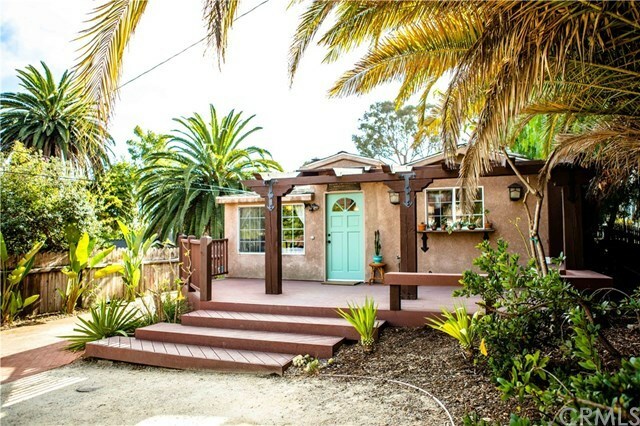 This completely remodeled Spanish bungalow offers highly sought-after downtown living. It offers the convenience of being steps from exquisite restaurants and shopping, yet the privacy of being tucked away at the end of a herringbone brick drive. The open floor plan is complemented by stylish features, which include exposed wood beams, a cozy fireplace, and arched bookshelves. The bright kitchen is fitted with natural wood cabinets, and off the main living area is a spacious bathroom with a double vanity. Both bedrooms boast ornate, leaded glass doors as private entries. Situated among mature trees and lush landscaping, a large outdoor deck with mountain views is perfect for entertaining. Towards the front of the lot stands a versatile office space within a fenced yard.